How Much Is a 1922 Silver Dollar Worth? The 1922 U.S. silver dollar is called a Peace dollar. It is one in a series of silver dollars minted between 1921 and 1935 to commemorate the end of World War I. 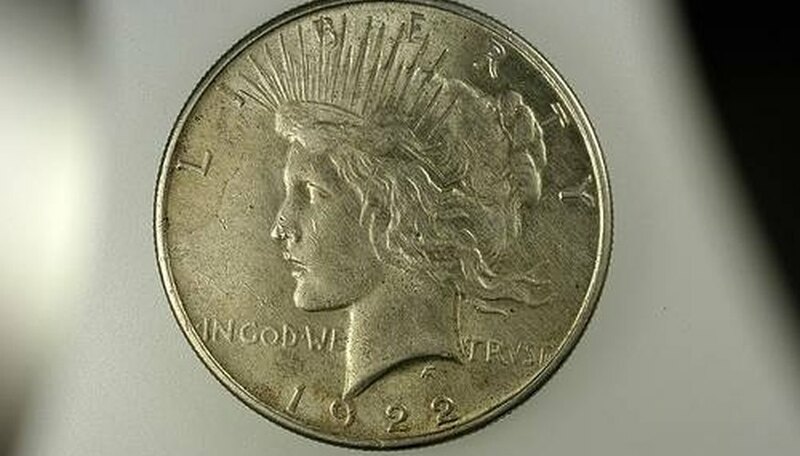 A Peace dollar is in Very Fine condition if Lady Liberty's hair is well worn above the eye but well defined over the ear. The eagle on the coin's back will have some feathers visible on the right wing's top and right edge. Value: $17 to $20. The coin is Extremely Fine if the hair lines over the brow and ear are slightly worn, and the feathers on the wing's top and right edge are faint. Value: $18 to $23. An About Uncirculated Peace dollar has only a slight trace of wear. It will have a mint luster but also contact marks. Value: $19 to $24. An Uncirculated Peace dollar will have no trace of wear but a full mint luster. Value: Philadelphia (no mint mark) $22 to $28; Denver (D), $30 to $32; and San Francisco (S), $30 to $32. In Choice Uncirculated condition, a Peace dollar can have contact marks in prominent places, and possibly impaired luster. Value: (no mint mark) $30 to $39; (D) $55 to $60; (S), $75. Gene Erik is a copy editor with Demand Media Studios. How Much Is an 1884 Morgan Silver Dollar Worth? What Is a Carson City Morgan Silver Dollar? How Much Is a One Dollar Silver Liberty Coin Worth?